The Napa Valley Transportation Authority (NVTA) conducted a study to analyze Vine Transit’s Express Bus service. The goal of that study was to evaluate existing express bus service and make operational and capital improvement recommendations to make the express bus network run more efficiently. The study identified and recommended operational and capital improvements to optimize the express bus system, including route alignments, , stop locations, and infrastructure enhancements to improve travel times. 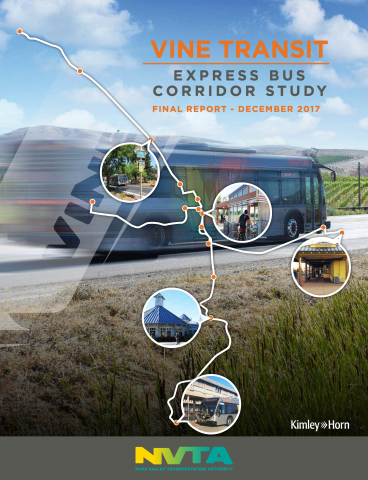 NVTA Vine Transit Express Bus Study is to identify the best strategic investments to improve the Vine Transit Express Bus system, encourage new ridership and reduce overall highway congestion in Napa County. What is an Express Bus, and what exactly is NVTA studying? I thought Vine Transit already had Express Routes? Vine Transit currently offers two (weekday only) express routes: the Napa-Solano Express (Route 21); and the Express to BART (Route 29). Vine Transit's current express routes offer some limited "skip-stop" service for buses to make fewer stops, but lacks other features common on express buses. Vine buses on the Route 29 Express to BART, for instance, must use the same lanes on SR-29 available to regular daily traffic. When Napa County residents were asked as part of a Community Based Transportation Study why they did not use transit, the highest number of respondents said the service takes too long compared with automobiles. A viable express bus system, often more affordable for commuters than driving a car, must also be faster, more efficient and convenient for users. So is this Bus Rapid Transit? No. Although a Bus Rapid Transit (BRT) system includes many of the characteristics of an Express Bus system, there are key differences. A typical BRT system mimics a light-rail system with more frequent routes, dedicated lanes for the entire fixed-route system and larger stations -- it's been described as a "surface subway" or a "subway on streets." Now that the study has concluded, NVTA staff will begin to prioritize projects recommended by the study. For more information or questions about the project, email NVTA planner Alberto Esqueda at aesqueda@nvta.ca.gov.